Archive strategies allow you to define discrete archive locations and methodologies for different types of projects. 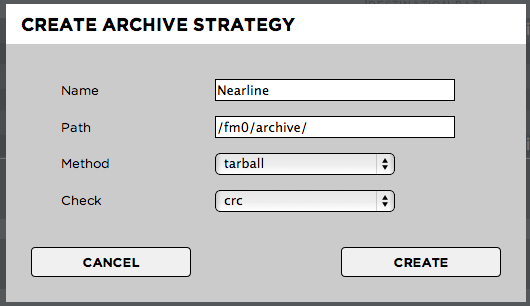 When a user presses the “Archive Project” button in the user front-end Strawberry will offer the archive strategies defined here. Plain: Strawberry archives the project and media files without compressing them. It archives the projects folder structure as it is. Tarball: Puts the project & media files of a project into a tarball before archiving it. Fingerprint: Sequential integrity check on a file that only detects serious file damages but no minor defects. CRC: CRCs are specifically designed to protect against common types of errors on data transmissions, where they can provide quick and reasonable assurance of the integrity of data delivered. However, they are not suitable for protecting against intentional alteration of data.